This third in a series of seasonal retreats offers direct experiences of earth-centered living to help us align our lifestyles and activities with the natural rhythms of the seasons. With Lauren Chase-Rowell and Beth Tener as your guides, you will experience a deeper sense of self-reliance and restoration of mind, body, and spirit. We are what we eat. We will explore growing and eating locally harvested food, which is a powerful and delicious way to reconnect to nature. • Collecting Wild Edible Plants – Discover nature’s bounty for free that is right outside our door; prepare what we find for lunch. 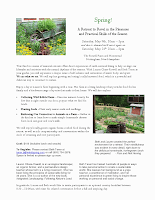 • Planting Seeds – Plant early season seeds and seedlings. • Embracing Our Connection to Animals on a Farm – Gather in the kitchen to learn how to make simple homemade cheeses from local raw goat and cow’s milk. We will enjoy locally-grown organic home-cooked food during the retreat, as well as rich companionship and conversation within the circle of returning and new participants. To Register: Please contact Beth Tener at tener.b@mindspring.com or call (603) 734-2878.Please register early as space is limited. We currently have a wait list for the May 9th event. Lauren Chase-Rowell, is an ecological landscaper, an organic farmer, and a permaculture design teacher whose farm is a living classroom. She has been living the principles of sustainable living for 30 years. She is a co-author of the new book, Integrated Landscaping: Following Nature’s Lead. Beth Tener has trained hundreds of people in ways to take personal action to create a sustainable world. She weaves her background as a yoga teacher, a practitioner of meditation, and her personal experience in green living to inspire those working on personal and social change. In gratitude, Lauren and Beth would like to invite participants to an optional country breakfast between 8:30 – 10:00am, with time for relaxed conversation before a full and inspiring day.